The PHC FX is the complete solution to manage the vital areas of your company. 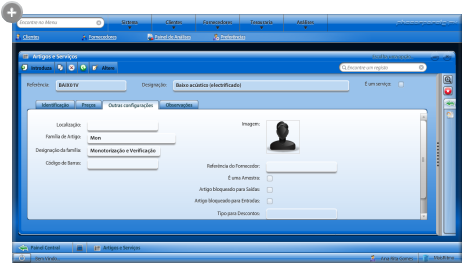 It is a management software, based on the standard RIA (Rich Internet Applications). Customers and suppliers, and proposed orders, and bank accounts, purchases and sales, receipts and payments. In other words, the key areas of your company managed and controlled accurately. Everything you need and ready to go! Wherever you are, is your business. On a computer with Internet, anywhere and anytime, will come face to face with your business information. Closely monitor your business from a distance. No need to worry ... just go! Everything was done to help and adapt to them. The windows, options and shortcuts to move intuitively meaningful and enjoyable. The software evolves at its own pace and needs. With PHC FX, have fun while working. The PHC software for micro FX was born. Technology PHC thinking about productivity and reduce costs. Go further with a reduced investment. Only pay for the software you use. With a SaaS solution (Software as a Service), reduces waste costs and adapts to the size of your business, without ever compromising with the chosen solution. Save and update all information about each customer. Since the issuance of invoices, cash sales, credit memos, delivery notes and proforma invoices, all documents required to charge their customers. Review each document to allow control of net profitability. You can have discount tables and send documents with up to 6 trade discounts and a financial discount. For each vendor creates the plug with all the information. Enter all purchase documents issued by the supplier, since their invoices, cash sales, credit notes or debit card. Where purchases can introduce a financial discount on the total percentage or value document. If the document received is identical to one already in the system, simply duplicate this and not have to repeat the data entry. The complete file of each item or service for use in documents, proposals, etc.. Create the several storerooms and manages the stock of each item in each one. Access a list of items with minimum stock to order. Every moment can know for each item the amount of orders from customers to suppliers and quantity ordered. Each payment includes the movements of current account you want and each one indicates the part is regularized. 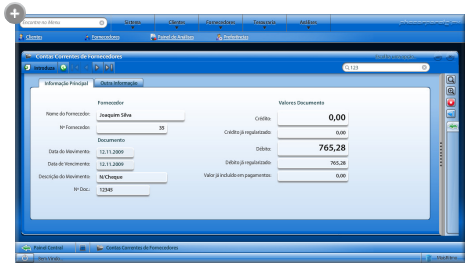 Indicates that the payment leaves the bank money, the check number and other data. Controls quickly where the money goes. If you want more information about the PHC FX, click LEARN MORE. * Each payment includes the movements of current account you want and each one indicates the part is regularized. * Indicates that the payment leaves the bank money, the check number and other data. Controls quickly where the money goes.